The property at 405 Denver St. N.E. as it looked from the street last week. Albany’s riverfront is my beat, and there’s a bit of potential good news on the north end of Denver Street. The owner of an abandoned house there has agreed to give the property to the city. So if everything goes according to plan, the city will be able to ban trespassing, clean the place up and then try to sell it. The six-bedroom house at 405 Denver St. N.E. overlooks Bowman Park and the Willamette River beyond. It has been abandoned by the owner, Gloria Jean Bodine, according to a staff memo going to the city council for its meeting Wednesday night. 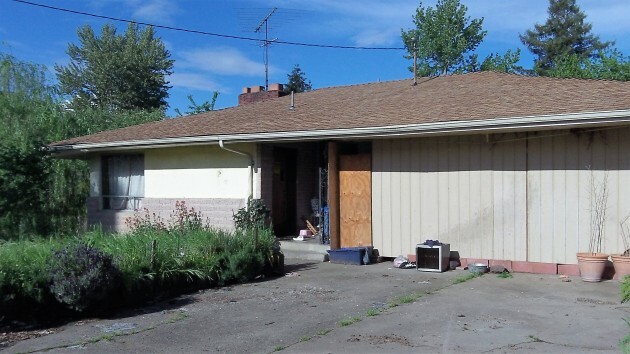 For about a year, the memo says, there have been “many code enforcement violations involving junk and trash, illegal drug activity and transients. The owner has signed a quit-claim deed handing the property to the city for zero payment. A pending bank foreclosure on the property is not yet complete, and if the council accepts the deed, which it is being asked to do on Wednesday, the city intends to seek an accommodation with the mortgage holder, Specialized Loan Servicing of Highland Ranch, Colo. The police have not had the legal power to keep transients off the property, as I understand from Assistant City Attorney Sean Kidd. The upside of owning the deed is that it will give the city the right to keep people out. And when it’s public property the county inmate work crew can help clean up the yard, with the result that the neighbors no longer have to look at the mess. The downside, according to Kidd, is the risk that the city would be cleaning the property for the bank. To prevent that, something will have to be worked out.